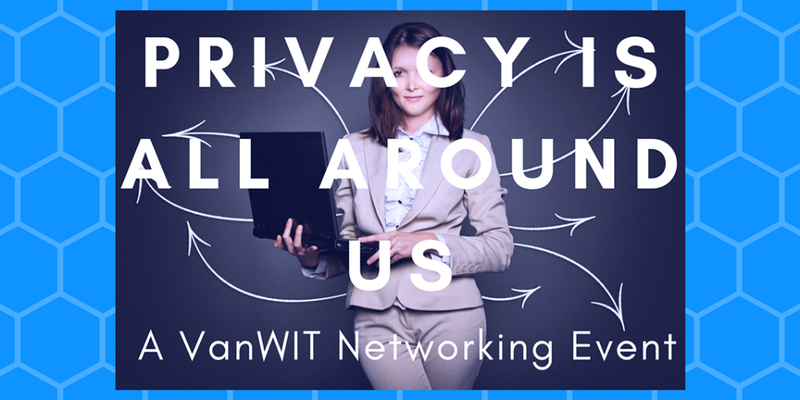 Join the VanWIT Community and Kirke Management Consulting for an engaging evening of networking over food and drinks along with a presentation and discussion on privacy and security management from two accomplished women in technology. Privacy is all around us. In a hyper connected world where data insight gives organizations a competitive edge, the risks of managing and safeguarding that data – specifically personal data – have increased exponentially. How then, as IT professionals, can we influence the importance of privacy and security management while at the same time we become enablers of innovative business models? Join us for this event where we will explore the opportunities that lie ahead in terms of increasing trust, reputation and brand exposure through the compliant management of Private information. Ale started her career as an IT professional working for large corporations such as Procter & Gamble and Johnson & Johnson. She also ventured into the entrepreneurial world working for boutique consulting firms when she moved to Vancouver. Her specialties at the time were the implementation and management of ERP systems and Customer Relationship Management (CRM) strategies. During her last corporate job with J&J, she partnered with various commercial groups in the organization, providing IT solutions in the area of Sales Force Effectiveness and Digital Marketing. This is when she was thoroughly exposed to the world of Privacy management. Wendy has an undergraduate degree in Economics and Finance. She started her career in Sales and Marketing in the IT and video game industry where she gained invaluable experience. After a few years of being on the road, she returned to school to complete an MBA in Finance and International Business. Since completing her MBA, she has held leadership positons as Controller, CFO and COO in the IT, Not-for-Profit and Healthcare sectors. Amongst her key responsibilities were to be the Chief Privacy Officer since 2001 at different organizations. She has lead the development of Privacy Programs delivering effective privacy policies and processes, ensuring privacy compliance to enable companies to achieve their business objectives. Wendy is passionate about privacy as a value-added driver of brand equity and business growth. We are a strategy consulting firm that enables business growth and minimizes corporate risk. We believe that safeguarding personal information has become paramount in a rapidly expanding digital world, therefore we help organizations gain relevant data insights to build tighter relationships with their customers, all within a strong privacy management framework. This results in increased brand recognition, improved reputation in the industry and trust within their customer-base. Kirke (pronounced “Kur-keeh”), the Greek goddess of transformation, used her powers and knowledge to transform anything that posed a threat into something harmless. At Kirke Management Consulting we strive to empower our customers to make that transformation happen and revolutionize their businesses.